☛ Why was the Erie Railroad line built? April 24, 1834, Jeremiah Pierson, who owned and operated several mines and mills in the Ramapos, had the foresight to persuade the New York legislature to authorize the construction of the New York and Erie Railroad. Construction started at Piermont on the Hudson with the final destination point as Dunkirk on Lake Erie. This gave Pierson an advantage in distributing his products. Going across the black dirt in Chester was one of the biggest obstacles in building the Railroad. In the 1840s the meadows were a huge swamp, consequently hundreds of piles had to be driven fifty feet to solid ground to create a base for the roadbed. On top of the piles, a trestle of equally strong lumber was built to support the line. In 1841 the first official station on the line was built here in Chester. It was an isolated structure in a wilderness landscape along the tracks that eventually became the focus for the village that grew around it. Chester and Goshen were the first stations on the Erie to have full time agents. On September 23, 1841, the first Erie passenger train made its scheduled stop at Chester. In 1851 the New York and Erie Company held a commemorative ceremonial train ride to celebrate the completion of the line. One of the more illustrative passengers was Daniel Webster, then Secretary of State. Webster decided against sitting in one of the passenger cars and opted instead to sit in a rocking chair that was placed on a flatcar, in order, he explained, to have a better view of the countryside. This was the precursor for future political strategies. For many years, dairy farmers in Orange County had been shipping butter out of Newburgh for sale in New York City. With the advent of the Railroad, farmers started shipping their butter by rail at shorter intervals. Thaddeus Selleck, Chester's first Station Agent, proposed the shipment of milk directly to the city. In 1842, Selleck, with Philo Gregory, the only farmer to respond to Mr. Selleck's proposal, organized the shipment of 240 quarts of milk by the Erie Railroad. It traveled 41 miles from Chester by rail to Piermont and then by boat 21 miles to New York City. Other farmers soon realized it was more profitable to ship milk than butter. In 1842, according to Mott’s “Between the Ocean and the Lake: the Story of the Erie” between 600,000 and 700,000 quarts were shipped to New York. By 1843, 4,000,000 quarts of milk were being shipped over the Erie. Orange County milk was in high demand. Farming interests in Orange County were revolutionized, and a new and nationwide industry was introduced into the American landscape. 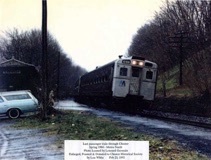 In the spring of 1983, the final commuter train made its trip through the Village of Chester. By the 1980s superhighways had changed transportation patterns and the Railroad closed the Harriman to Middletown line. By November 1984, the tracks had been taken up. Chartered by the New York State Department of Education, and formed in 1964, its mission is to promote the rich heritage of the Village and Town of Chester, New York. The Historical Society accomplishes this through the restoration and preservation of its historical places, documents and recordings of oral history. It also provides educational programs to the public and exhibits its collections of pictures, newspapers and recorded oral history. In 1915, through the efforts of Messrs. Robert Goelet and Richard Delafield, a new station was built. The 1841 station was moved to the east of the new station and used for freight. The restored 1915 station museum now houses exhibitions of local and historical interest It is open Saturdays, May through October, 9:00 am–1:00 pm with tours for schools and local groups by appointment. Street address is 19 Winkler Place, Chester, NY 10918. 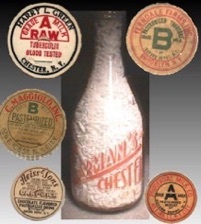 The Chester Historical Society holds its monthly meetings at the museum and space is available to local groups. It is handicapped accessible. Annual events held at the museum include: the Chester Historical Society's annual yard sale fundraiser, the community tree lighting celebrating the holidays with the museum open for special exhibitions. With its location on the Heritage Trail, several charity walks/runs utilize the museum's hospitality yearly. In 1984 a decision was made to pursue the acquisition of the 1915 Erie Depot with the goal of making it our local history museum. In 1990 fund raising began. Individuals, organizations and businesses gave time and money. The Society also obtained several government grants. Volunteers cleaned up the building and grounds. In July 1991, Orange County officially leased the station to the Chester Historical Society for 99 years at one dollar a year. The Society worked diligently for the next eight years. The repairs included: roof tiles, gutters, rafters, new utilities, window restoration as well as grounds and a handicapped restroom. Between contractors and volunteers the Historical Society reached its goal and opened its doors to the general public at a Grand Opening, June 12, 1999. There is work still to be done. We are grateful for all the help given by the many government agencies, businesses, organizations and individuals who contributed to the success of this community project located in Historic Downtown Chester. When completed, the Heritage Trail will extend from the City of Middletown to Harriman, a total of 19 miles. Eleven miles are already completed from Hartley Road to Airplane Park. By summer 2010, the section from Airplane Park in Monroe to River Road, Harriman will be paved. Currently there is free parking and access in both the Village of Chester at the Chester Depot Museum and in the Village of Goshen at St. James Place behind Berkshire Bank. Trail users may enjoy biking, walking, rollerblading, nature study, as well as shopping or dining in the local villages.